Oct. 20 /CSRwire/ - SAN FRANCISCO,CA. - Oct. 20, 2008 – Adina for Life, Inc., www.AdinaWorld.com, launches Natural Highs(TM), the first TransFair USA certified, all natural coffee energy drink, now available nationwide at Whole Foods Market(R) stores. 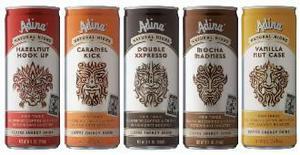 Adina is the first to market a coffee energy drink that enhances and preserves the full benefits inherent in the coffee bean through a proprietary cold-brewing process to deliver a sustainable energy kick along with the antioxidant equivalent of four servings of fruit per container (as measured by ORAC/USDA ). Inspired by a vision of a world that "Drinks No Evil," an international team of entrepreneurs from Odwalla(R), SoBe(R) and Peet's Coffee created Natural Highs for consumers seeking to energize their day with a healthier energy alternative that does not contain any artificial ingredients or chemical additives. Using premium single-origin, Fair Trade organic Colombian coffee beans, Natural Highs delivers a responsible yet effective botanical-based caffeine boost in each 8-ounce can, compared to the crash-and-burn health risks associated with synthetic caffeine, taurine, high-fructose corn syrup and sucrose that fuel most energy drinks on the market. With 100 milligrams of natural caffeine per can, Natural Highs provides a healthy energy boost. "The beverage landscape is littered with products providing empty calories, chemicals and artificial ingredients," said Adina Co-founder/Chairman and Odwalla Founder Greg Steltenpohl. "Adina Natural Highs is the ultimate functional beverage that provides an all natural energy option and at the same time supports Fair Trade for a more sustainable future." Available in five flavors, Caramel Kick, Hazelnut Hookup, Vanilla Nutcase, Mocha Madness and Double Xxpresso (which provides an extra 50 milligrams of caffeine), Natural Highs is sold in 8-ounce, single-serving cans and has a suggested retail price of $1.99. Natural Highs will also be available in a convenient four-pack that may be chilled at home, the office or wherever a pick-me-up is needed. "The U.S. energy drink market is worth $5.4 billion annually, and coffee is the original energy drink," said John Bello, Adina board member and co-founder and former CEO of SoBe(R). "There's a lot of bull in the energy category. Adina drinks produce a healthy high, the way nature intended." Whole Foods Market began national distribution for Natural Highs on Oct. 1. "We are excited to be the first to offer the Natural Highs coffee energy drink. This product provides an all new coffee- based option in the energy category for our customers," said Errol Schweizer, Associate Global Grocery Coordinator for Whole Foods Market. Adina recently signed a distribution agreement with industry leader Haralambos Beverage Company for placement of Natural Highs in key Southern California outlets, including Los Angeles, Orange, San Bernardino and Riverside counties. The prestigious distributor – known for pioneering consumer trends – serves both off-premise outlets, such as retail stores and delis, and on-premise locales, including hotels, restaurants, nightclubs and bars. Nationwide, all Adina beverages have been approved for distribution by UNFI, the top distributor of natural products. Adina Natural Highs ready-to-drink beverages will be available in-store in refrigerated beverage sections, coffee sections and beverage dry shelves. Interested distributors should contact Bruce Schroder at (650) 743-7771. Founded in 2004, Adina for Life, Inc., is led by a pioneering team of entrepreneurs from Odwalla, SoBe and Peet's Coffee & Tea. Inspired by the founders' vision to create a world that "Drinks No Evil," these industry innovators came together to grow Adina and change the way the world does business—one drink at a time. The company is dedicated to producing great-tasting, better-for-you Fair Trade beverages, using only natural and/or USDA organic, directly sourced ingredients from around the world. 1 ORAC (Oxygen Radical Absorbance Capacity) is the most widely used benchmark method measuring the scavenging capacity of antioxidants against the peroxyl radical, which is one of the most common reactive oxygen species (ROS) found in the body. The USDA has used this method for classifying the antioxidant levels of standard servings of fruits and vegetables in its Nutrient Data Laboratory.